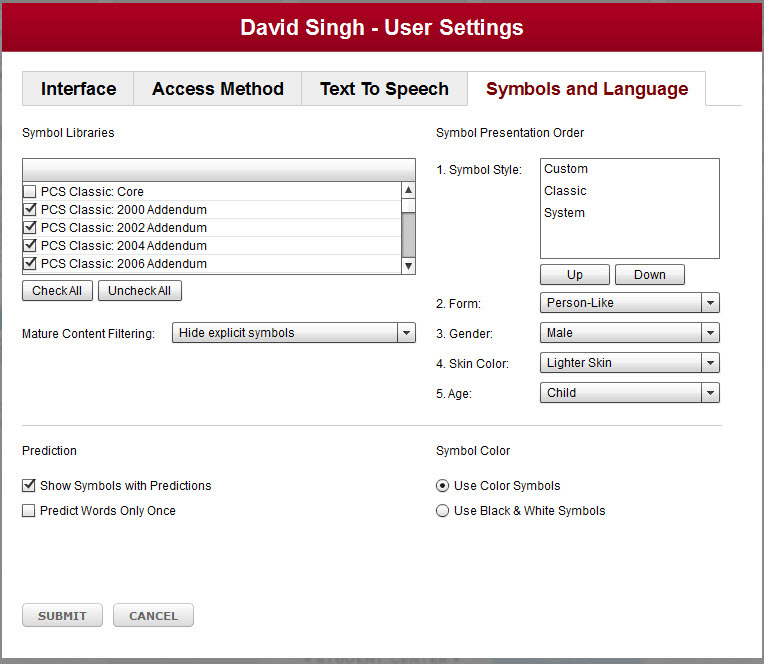 Select the Symbols & Language tab on the User Settings dialog to set your symbol preferences when you are customizing an activity for a specific student. You also use the Symbols & Language Settings to define word prediction settings. Symbol and language settings are changed through the User Settings dialog. 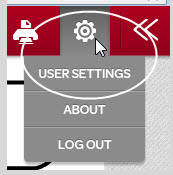 There are two ways you can access the User Settings dialog - through the Edit link on the student profile and from the toolbar of any activity that is playing in the Boardmaker Student Center. 4. Select the Symbols and Language tab. PCS Classic Core - These is the original symbol library of simple, clear drawings developed by Mayer-Johnson for use in augmentative and alternative communication. These symbols are easily recognizable and appropriate for all ages. PCS ThinLine - This is a library of symbols, developed by Mayer-Johnson, with a clean, more detailed look. System Symbols - This library primarily contains symbols that are used to indicate navigation and gadget functionality. If you wish to use a language-specific symbol library, select the check box for the library you wish to use. Select Show all symbols if you don’t want any restrictions on your symbol searches. Select Hide explicit symbols to block those symbols in which the representation - the symbol itself - is explicit (clearly and precisely drawn). Select Hide symbols of mature words to block those symbols that represent mature themes and that would not be appropriate for students of certain ages or cognitive levels. You can choose the order in which the symbols are presented in your symbol searches. 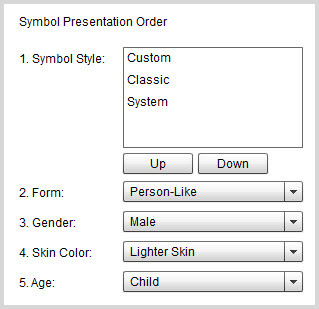 You can select a symbol style, human "form," gender, skin color, and age. The software will present symbols in the order you have selected, based on availability of symbols that meet your criteria. Make your selections under Symbol Presentation Order. Select the symbol style that you want to appear first when the results of your symbol search are displayed. Symbols are displayed in the Symbol Style list in the order in which they will be presented. a. Select one of the styles shown in the Symbol Style list. b. Use the Up and Down buttons to move the symbol style up or down in the list. Shortcut: You can also select a symbol style and drag it up or down in the Symbol Style list. 2. Use the Form drop-down menu to choose the preferred type of illustration depicting the human form. 3. Use the Gender drop-down menu to choose the gender of the human symbols you would like to be displayed first. 4. Use the Skin Color drop-down menu to choose the skin color of the human symbols you would like to be displayed first. 5. Use the Age drop-down menu to choose the preferred age for the human symbols you would like to be displayed first. Select the Use Color Symbols or Use Black & White Symbols radio buttons to set your preference for the symbol display. You can change the way that word predictor buttons react when the student types text into a message window. Select the Show Symbols with Predictions check box if you want symbols to be displayed with the predicted words.